My name is Doni and I'm a brand new DT member! Here's a fun little card you might like to try. I started with the Snowfall Backdrop die which is a landscape die, but I wanted to use it vertically. 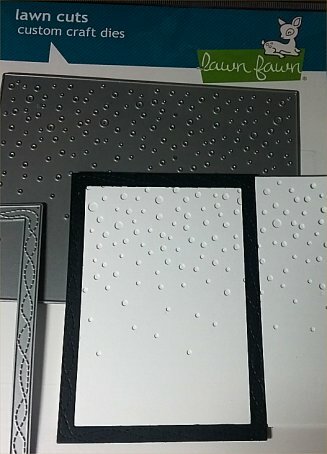 So, first I die cut the Snowfall Backdrop, layered it over white card stock, then cut the panel down to the size of the black frame I was using. 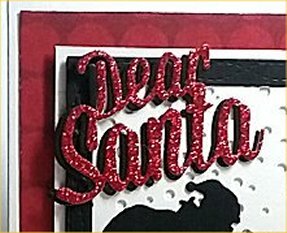 I cut the Dear Santa twice, once out of red glitter paper, again out of black card stock and then layered them together for a shadow effect. Thank you for stopping by today and sharing a little piece of your day with me. I hope you will create a project, and come play along at the Dies R Us Challenge Blog for your chance to win a gift voucher to the Dies R Us Store. A new challenge begins on the first and fifteenth of every month. Be sure to Follow Us on Facebook too. What a fun holiday card! Great job Doni and once again ... WELCOME to the team! 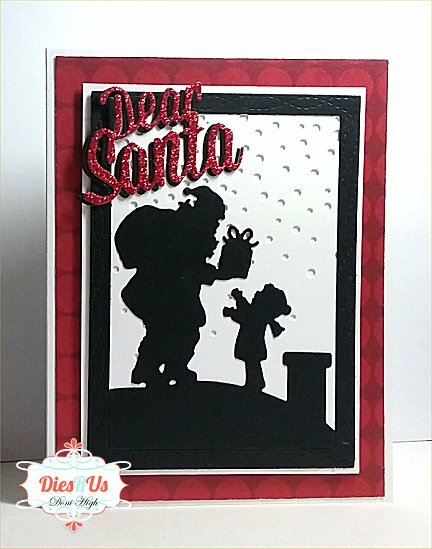 Fabulous use of dies on this sweet Christmas card! Awesome inspiration ... thanks! Fantastic card! Love the red glitter paper with the shadow layer behind it! This is so fun! Love that Santa die! Hi Doni! What a great first make Teamie! Its adorable and perfect in these contrasting colors. The glittery sentiment rocks and the snowfall backdrop texture is the perfect touch. Welcome to the team Doni! What a fun and festive card. Love the tip for the snow background. The added texture of the word is awesome.